In order to give the division the opportunity to get to know each other outside the office, Glen, our executive head, took the whole of BCS (Business Consulting Services) onto a breakway to Sparkling Waters, a resort about 1,5 hours outside of Johannesburg. Activities included teambuilding exercises, swimming in the pool (it was still quite cold though), a braai, more team games and and and... (drinking of course). 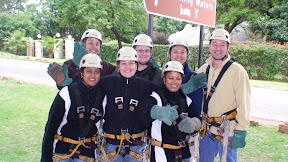 The highlight was a canopy tour sliding from platform to platform to through a gorge. Was macht deine Silvesterplanung? Kann man dich mal per Skype erreichen?